Dominica joins the rest of the international community today in celebrating World Down Syndrome Day 2019. This initiative started in 2012 as a global awareness initiative backed by the United Nations. The theme for this year’s celebration is #LiveNoOneBehind. Numerous health educators in the Ministry of Health had discussions and educational sessions with school students from Tuesday this week. Health Educator in the Health Promotions Unit, Sabrina Bernard was among the health educators visiting schools this week. “Yesterday I went to the Joan Beau Pierre Primary School in La plaine and I had a session with the Grade 3, 4 and 5 students, we had a session really raising the awareness and really educating them on Down Syndrome and also that they should not discriminate persons with down syndrome but treat them as equal and as human beings.” she said. Bernard confirmed that the World Down Syndrome Day is observed by wearing mismatched sicks to represent the differences. The socks campaign is intended to spark talks about diversity, inclusion, uniqueness and acceptance. 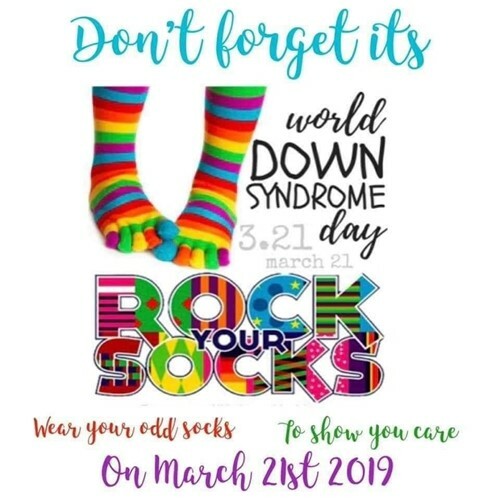 The general public is urged to participate in this year’s World Down Syndrome Day by wearing a different sock on each foot to work, college and other places celebrating the day. She stated that the relevance of the sock as the campaign for Down Syndrome Day is the different shape of a chromosome a person with down syndrome would have. Bernard further explained how down syndrome occurs, essentially when there is a split(in three) of the 21st chromosome which would leave an extra chromosome.